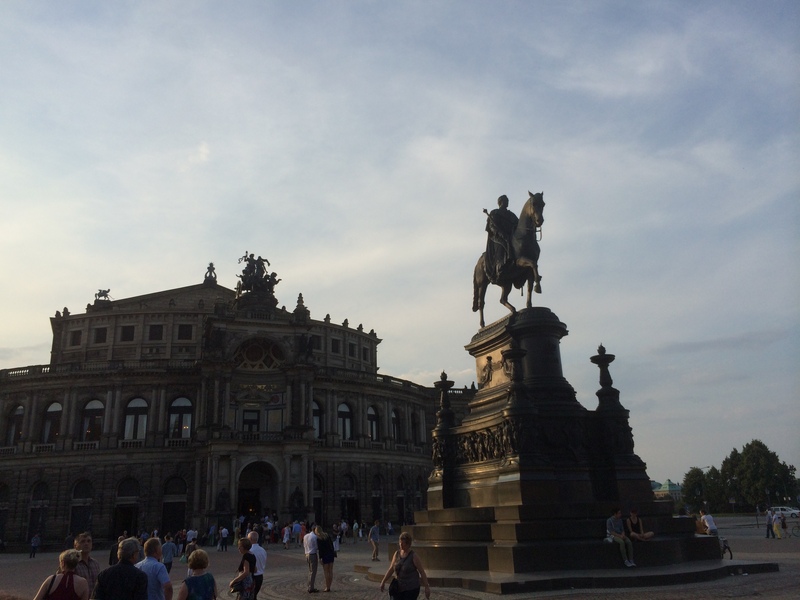 On my last day in Dresden, I had been planning to visit, and to take a tour of, the Semperoper (Opera House) in the old city. Word is, it’s as beautiful on the inside as it is on the outside. And that’s cool. But then, just before I was about to leave to take the tram down there, I found myself (inspired by the story I’m working on) researching the Stasi and their role in things in Dresden. I discovered that a former Stasi prison is open to the public as a memorial to their brutalizing the population there. Of course, I had to go there instead of to the opera house. I walked the 3km to (and I took the train back from) the Gedenkstätte Bautzner Strasse (Bautzner Street Memorial) and headed in. First of all, the place was essentially empty. Maybe four other people were wandering during the 90 minutes or so I spent exploring. 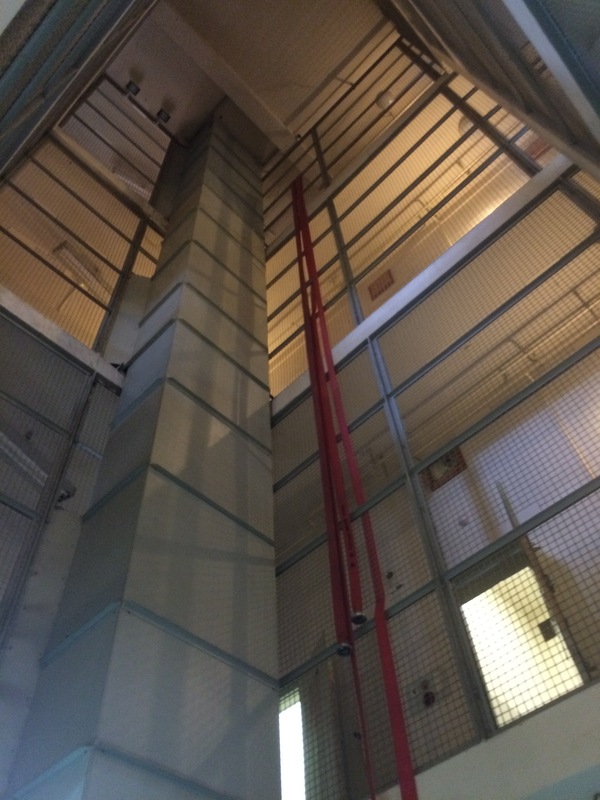 Here’s what it comprises: four floors of prison cells; one outdoor yard (with catwalk for armed guards, though this is not accessible to visitors); and a long basement-ish corridor to USSR area holding and interrogation facilities of Stasi. It was, of course, disturbing. People were held for long periods of time, usually in solitary confinement. They were not able to communicate with other prisoners by any means (the prison even went so far as to innovate a white noise generator in the pipes to prevent prisoners from speaking through drained toilets). The prisoners were interrogated to no end, had their sleep interrupted every 15 minutes with lights-on body-position checks, and the little correspondence they were permitted to send out to family was (of course) screened and censored. Their families were not advised of their so-called crimes – not even the guards were permitted to know what a prisoner (identified by a number rather than a name) had supposedly done. Reports vary as to the number of people directly employed by the Stasi (the “sword and shield of the state”) and the number paid surreptitiously at the time the Wall came down in `89. Basically, though, the story is that around 100k people worked for them above board and 200k people were paid informants (read: neighbors paid or gifted something valuable to inform on neighbors, parents, spouses, etc.). That’s a huge percentage of a country (1 for every 63 persons in the country, according to wiki). It must have been terrifying, to say the least. To cap it off, I watched Das Leben der Anderen last night. Watch it, if you haven’t. You’ll get an idea of the sort of tactics the Stasi used in East Germany. The thought that struck me was one that hit me last year at the Sachsenhausen concentration camp: Germany traded one dictatorship for another, and its citizens were manipulated and terrorized in many of the same ways in each case – essentially, terrorized for sixty successive years. That’ll do a number on a country’s collective psyche. All of this, of course, reminded me of last year’s visit to the Stasi HQ in “Die Runde Ecke” in Leipzig. Someday, I’ll write an entry for that, too. Inside a Stasi office in die Runde Ecke (“the round corner”), first occupied by the SS (during WW2) and then by the Stasi (until 1989) in Leipzig, Germany. Today, I arrived in Berlin. I absolutely adore the city. I don’t say that about a lot of things. Actually, I’m not sure I’ve ever used the word to describe how I feel about a thing/place. But there you have it. This entry was posted in Travelogue, Travelogue 2015 and tagged Dresden, europe, germany, imprisonment, interrogation, KGB, prison, Secret Police, secret prison, Stasi, Terror, traveling, travels, USSR. Bookmark the permalink.